The 5 a.m. start in our day was rewarded with a beautiful sunrise and a super yummy breakfast at the Seawall’s IHOP. If you haven’t gone and tried the Limited Time Cinnamon Roll French Toast, you are missing out! That with bacon, eggs, hashbrowns, and bottomless coffee has got to be one of the best breakfasts I’ve ever had in my entire life. We headed across the street to walk along the shore, which gave me this amazing view. But don’t be fooled. It might have only been 8:15 in the morning, but it was already about 85 degrees. Once it became too hot, which wasn’t long after I took the picture of the shore, we headed back to the car and decided to explore. Like, really explore. The Rosenberg Library popped up in our Google search for “things to do in Galveston on a budget”. I love books, which naturally leads to an excitement when I saw the library on the list. Not only is it the oldest and still functioning library, there’s also a museum on the top floor of it. Fascinating, isn’t it?!? After spending time in this beautiful library, we drove down Sealy in search of carved tree trunks. It’s an exciting scavenger hunt. You pretty much drive up and down the streets to find tree trunks of art that may or may not be visible in residents’ yards. There is a map with the location of these trees located in the Visitor’s Center, which is directly across the street from the Rosenberg Library. The carvings are impressive, but I don’t think it’s something I would go out of my way to see. I may go down one street just for kicks, but I wouldn’t go through the whole map again. We discovered a hole-in-the-wall coffee shop en route to the library and decided to circle back to try it out. It had good Yelp ratings, so it must be good, right?! I was not disappointed, and neither was my boyfriend who is the avid coffee drinker between the two of us. If you know me, you know how much coffee I drink… now triple that amount and that’s where you’ll find him. This Happy Coffee Shop is a little shop in a tiny strip that shares a parking lot with a car shop. The woman who I think runs the entire shop took my order and recommended the Soy Latte. 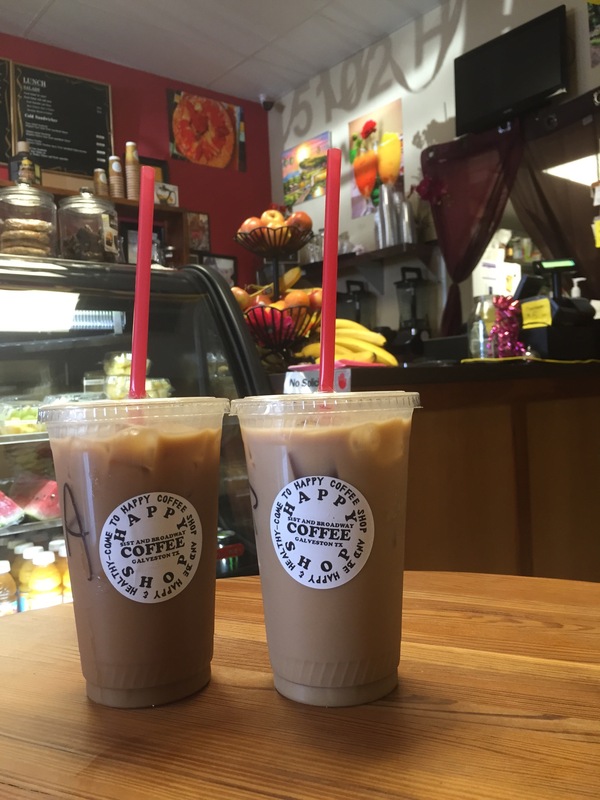 “Iced or Regular, it’s still my favorite.” My boyfriend decided on that while I craved an iced caramel latte with almond milk. It was nothing short of fantastic!! I usually like a more bitter taste to my coffees, and this drink did the trick. It wasn’t too sweet, nor bitter. My boyfriend thought the same with his iced soy latte. Although, the soy latte is a bit sweeter and does not have any bitter taste to it. Still great! And their regular sized drinks are pretty big, actually! PLEASE check it out if you’re ever in the area. I wouldn’t say it’s a convenient place to stay and chat if you have a group larger than 5 people, but it is a great place if you want a more intimate setting without actually making things more formal than need be. Upon leaving this little shop, I suddenly grew curious of the Moody Mansion. It’s that big dark red house on the left side of the street that I’ve seen every trip to the beach for as long as I can remember. With another quick search on Yelp, and finding that there is a student discount for a group tour, we decided that it wouldn’t hurt to find out what this house is all about. The group tours run every hour, I believe, and each tour takes 18 people. When we came to get tickets, we had to buy them for the next hour.. An hour to kill? Fortunately, we found a garden across the street. 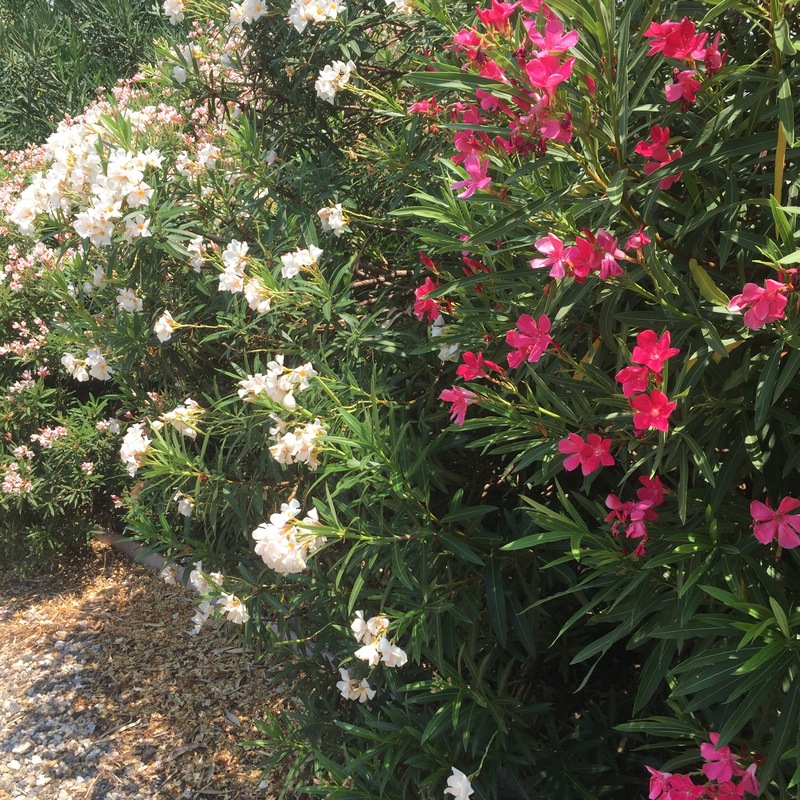 The Oleander garden is a tiny little place, but it holds some pretty beautiful plants…. and a patio with benches and a fan. It was still scorching hot, even with the fan, so I’d recommend visiting this garden around October-November. When we were finally able to go on the hour and a half tour, we were not able to take pictures inside the house..Sorry! I’m going to assume that I probably should not tell the whole story of the Moody Mansion’s history, nor describe its mind-blowing features. I will say though that it was worth the visit. The house is gigantic, and the history is astonishing. There are even some parts of the house that have maintained its original state… so you’re literally looking at wood, decor, and finishes that date back to the late 1800’s. Not to mention, there are original artifacts, and artworks that have been salvaged since that time, too. What a story! What a sight to see! It’s completely mind-boggling. I’m happy to be living in Houston where I can take spontaneous trips to Galveston just to explore its city. I encourage y’all to do it, too. You never know what you’ll find.There are more pictures of our trip below in the slideshow if you’re interested! Keep loving, living, and exploring!